Special Report: Is it TEE Total Extortion? In the five-year twisting tale of Augusta’s TEE Center project, we who have observed the events and decisions as they happened, learned to expect the unexpected. This didn’t keep reporter Susan McCord’s tweetfrom the September 24, 2012 Augusta Commission meeting from astounding me. “Paul Simon: If documents aren’t approved by Oct. 15, (we) will have to cancel January police chiefs convention at TEE center,” she typed. My jaw dropped at the audacity of the city’s Tee Center partner suddenly resorting to what looks like a shakedown to get a management deal approved. Simon’s Augusta Riverfront LLC is getting a $2 million a year subsidy courtesy of an unsigned, undated proposal from 2007 and that isn’t enough for him and his partners at Augusta Riverfront LLC? Augusta has been held hostage since then. What is worse is that the City Administrator, legal counsel, and Augusta Convention and Visitors Bureau might be the source of this clumsy, heavy handed way of extorting an agreement out of a suddenly reluctant Commission. It is impossible for me to accept this assault by Management Agreement on the city’s finances in silence. · Augusta built at least $50 million in new buildings across multiple parcels owned by this Riverfront organization and probably $20 million of existing buildings, yet now is held hostage to liens on some of them? · There will be hundreds of pages of recorded easements, cross easements, assignments, and agreements on these lands, meaning that Augusta has all of the costs of land ownership, but few of the packages of rights that come with land ownership. Can’t we at least get a fee in lieu of taxes? · The unsigned, undated partnership agreement from 2007 says throughout that Riverfront is responsible for kitchen equipment while saying that Augusta is responsible for the kitchen space. Augusta has not been able to show where its City Commission has ever voted to change the partnership agreement, only that Augusta approved the change order to add $1.4 million of equipment to a project that Riverfront agreed to participate in as a builder and operator. Where is Augusta’s money? · The September 24 meeting was the first the Commission as a body had seen of the catering or management agreements and they were presented with an ultimatum that the documents have to be approved within 22 days! Five years of dithering and now the people of Augusta are presented with a manufactured emergency? Why? Keep reading! · Can we say there might be C-O-N-S-P-I-R-A-C-Y within Augusta government? Darryl Leach was the General Manager of the Augusta Marriott.On September 24, Paul Simon announced the Tee Center is now the AUGUSTA CONVENTION CENTER.The agreements that Augusta has been commanded to execute are now with an entity called the Augusta Convention Center Management LLC. This is where things get really get good. Darryl Leach is now the General Manager of the Augusta Convention Center. In fact, it seems nearly all of the former Marriott Augusta Staff, Don Fuller, Janet Pierce , Greg DeSandy and Sharon Koon, are now on the Augusta Convention Center Team! · Consultation with the Georgia Secretary of State Corporations Division does not show Augusta Convention Center Management LLC as being registered to do business in Georgia. 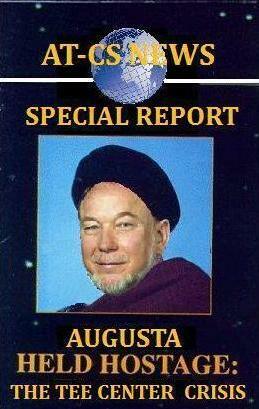 Augusta is being demanded to execute an agreement with an entity that does not yet exist? · Augusta is forced to deposit $250,000 at the beginning of the year into the operating account, but if the balance in that account falls below the amount to fund that account for the next 90 days, Augusta is required to contribute from GENERAL REVENUES enough funding to meet those expenses without regard to how soon the next $250,000 funds injection is required!!!!! The original partnership agreement limits Augusta funding requirements to $250,000 for operations and $100,000 for capital, yet this management agreement calls for an unlimited pipeline of funding from Augusta? Who authorized or negotiated that? · The unlimited ability of this Augusta Convention Center Management LLC to establish what costs are is not limited by the Annual Plan that the Augusta Commission approves, because “the Annual Plan will be only a planning tool.” Also, shouldn’t references to any Annual Plan limits be clearly defined not just as the types of costs to be included, but the amounts as well? · The management agreement provides for annual audits only, with no real-time or even monthly reporting. How can Augusta monitor these cost reimbursable agreements without continuous reporting and the strongest of audit rights? Shouldn’t these agreements be made subject to open records requests? Maybe the Augusta Chronicle can help us! No? · The management agreement called for the CVB to begin marketing for the Convention Center with execution of the construction contract to the tune of $350,000. However, the use of these funds by the CVB to market the Center before it opens was against the city’s own ordinance. The Tee Center management agreement looks to have morphed into an agreement that allows most of the administrative staff of the Augusta Marriott to be shifted to Augusta’s Conference Center expense. There are unexpected liens on some of the property under the Center and a parcel that was not liened never was conveyed prior to construction. The Augusta Administrator promised the agreement was nearly complete over 3 years ago and now has provided the city commission with just 22 days to review and approve the contracts. The entity that Augusta is contracting with may not exist yet. The operating expenses, capped by the 2007 partnership agreement, are now unlimited conduits to the general funds of the city. The contracts fail to provide real-time program management and accounting. The Augusta Commission should walk away from these agreements and put the management and catering agreements out for bid. Otherwise outside counsel from far outside of Augusta needs to be brought in to renegotiate the management agreement to conform to model contracts from other cities. Beyond this, it looks to me that Commissioner Bill Lockett’s idea of a forensic audit or a county-funded investigation of these transactions needs to be revisited. The project was funded by sales taxes, there are ample unused sales tax revenues in the coffers of Augusta, and legal costs are legitimate uses of sales tax money. Can all of these issues and the progression toward the renaming of the TEE Center as the Augusta Conference Center be just incompetence? Can Augusta afford an unlimited pipeline to its general revenues? Tagged Augusta Commission, Augusta Politics, Augusta Riverfront LLC, Brad Owens, Investigative Reports, Paul S Simon, TEE Center.